WCWC is committed to supporting drinking water systems in First Nations communities. We are committed to provide the highest quality training experience - from course content and methodology through to highly qualified instructors. Visit our training page for more information. WCWC's online resource library offers information on emerging and current issues, First Nations resources, regulations and much more. 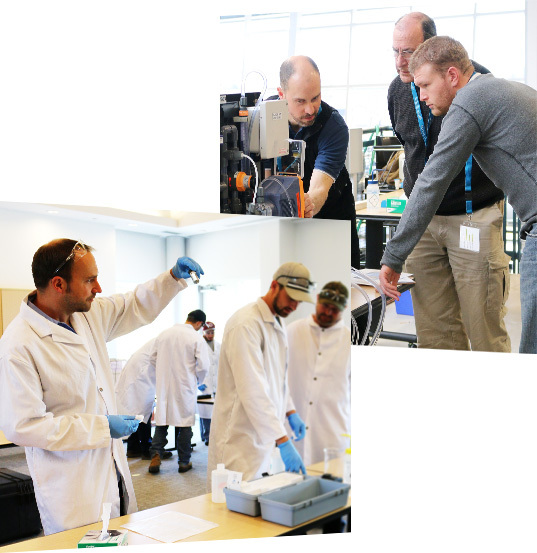 Pilot testing provides information to WCWC's clients to enhance their understanding of their source water characteristics, the performance of their treatment and those of alternative treatment options. Walkerton Clean Water Centre (WCWC) is an operational service agency of the Government of Ontario, established in 2004, to ensure clean and safe drinking water for the entire province. WCWC coordinates and provides education, training and information to drinking water system owners, operators and operating authorities, and the public, in order to safeguard Ontario’s drinking water. Through partnerships, WCWC also provides training for the 133 First Nations communities in Ontario. To date, high-quality training has been provided to more than 80,000 participants across Ontario. It [Maintenancefest] is continuously good. Every time I’ve come, I’ve always taken something home with me. Very informative course and great hands-on experience. The instructors are amazing! Overall great course content. Trainers very knowledgeable! Taking this course made me feel more comfortable to be audited as well as I gained the knowledge required if I ever had to audit another system. Thank-you! Drop us a note with any questions about education and support around safeguarding Ontario’s drinking water. We’ll get back to you as soon as we can.